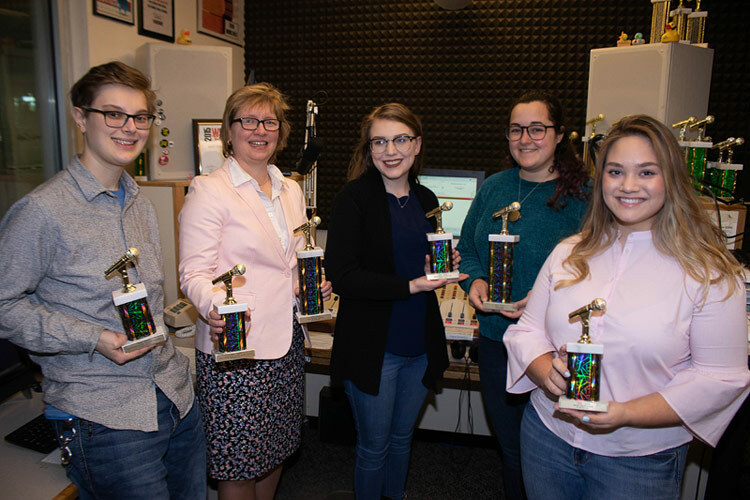 April 4, 2019 - WRKC (88.5FM), the King’s College radio station, received two first place and four finalist trophies at the Intercollegiate Broadcasting System Awards held recently in New York City. The station and its staff members competed with schools across the country for the accolades. The station won a finalist award for Best College Radio Station for colleges and universities with fewer than 10,000 students. First place winners were Samantha Bucher for Best Logo (WRKC 50th anniversary) and Dan Stokes, class of 2018, for Best Sports Update. Additional finalist trophies were earned by Scarlett Spager, news director, for Best Spot News; Katie Pugh, former station manager, for Best Community News Coverage; and Lauren Gallagher, station manager, for Best News Interview. WRKC is celebrating its 50th anniversary in 2019 and is the oldest non-commercial radio station in Wyoming Valley. The station is home to the oldest over the air radio reading service in the country, “The Radio Home Visitor,” serving the blind, visually impaired and homebound every day. The service began in 1974. “The national recognition for the students and our station is an amazing testament to the work these students do every day,” commented Sue Henry, WRKC general manager. Pictured, from left, is Pugh, Henry, Gallagher, Bucher, and Spager. Absent from photo is Stokes.